RIP: Kaudha Hailat Magumba. Courtesy photo. 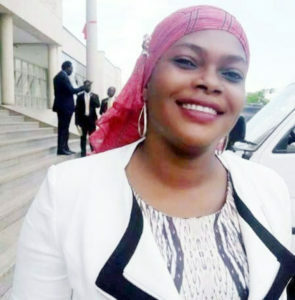 Iganga District Woman Member of Parliament Kaudha Grace Hailat Magumba is dead. Magumba succumbed to preeclampsia at Mulago hospital (Kawempe extension) where she had been referred from Case Clinic in Kampala. Preeclampsia is a pregnancy complication characterized by high blood pressure and signs of damage to another organ system most often the liver and kidney. Preeclampsia usually begins after 20 weeks of pregnancy in women whose blood pressure has been normal. Even a slight rise in blood pressure may be a sign of preeclampsia. Born on October 14, 1986, Magumba was serving her first term in Parliament having replaced Olivia Kwagala Kabaale as Iganga District Woman MP. She is the third member of the tenth Parliament to die this year after Moroto Woman MP Anne Logiel and Toroma County MP Cyrus Amodoi Imalingat. Magumba is survived by a husband and one child. She will be laid to rest on Sunday, July 9, in Iganga Municipality.